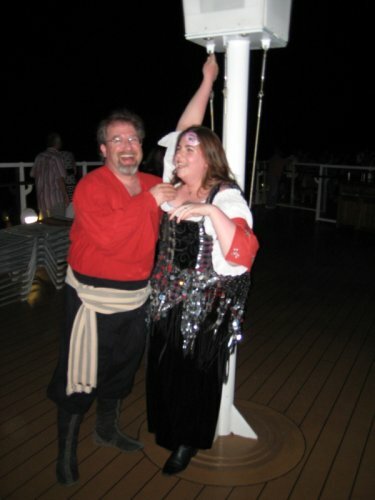 The picture was taken on our most recent cruise, during the pirate night celebrations. We're both fairly whimsical and care a lot more about having fun and being ourselves than what other people might think, which is overall a great way to have a happy life. Hubby and I met while he was selling tickets at a midnight movie. I thought he was flirting, he was trying to shmooze me into &bsp;going to the science fiction convention that he was helping run. In due time (and with the 'help' of friends whose playbook still went back to junior high hijinks such as inviting us both to a dinner and then playing musical chairs so that he'd have to sit next to me) we ended up dating. We're both geeks (computer, comic book, movie, books, gaming, etc) and I think I swooned the first time he showed me around his house and I saw the walls of book shelves stacked three books deep. A year and a half after our first date, he proposed in front of five hundred of our nearest and dearest friends (on stage at that convention's opening ceremony). We've been together almost nine years now, married for seven of them, and time very much does fly when you're having fun. He is my best friend, my favorite playmate, and my superhero. He has been with me (and been my rock) through joblessness, grad school, and unexpected health problems (stupid faulty eyes) and I have had the honor of being his shoulder to lean on when his father passed away and the loss of two dear friends. We've shared our successes too, (graduation! job advancement! new house!) and even the every day little joys are made brighter because we get to share them. I say, without hesitation and with absolute sincerity that my worst day with him is a thousand times better than my best day without him, and that he still makes my heart leap when he comes into the room. And yes, even I get a little disgusted at how shmoopy and fluttery I get about him.